But are vampires a special case? After all, if vampirism is contagious — if vampires procreate via blood sucking — then vampirism carries with it the seeds of its own destruction, whether we view markets as a creative process or as moving toward some equilibrium. But this critique begs the following question. If vampires exist, and if vampirism is contagious, etc., etc., then why are there still so many humans — over seven billion of us at last count! 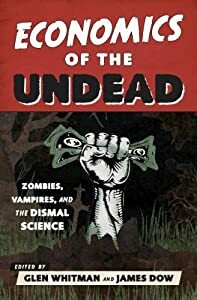 In any case, to the extent some humans would actually prefer to become vampires — economist Steven Levitt immediately comes to mind; listen to the beginning of the Freakonomics podcast — legal markets would channel vampire procreation in a positive sum and mutually beneficial direction. Rather than taking blood by force, risking lethal retaliation, vampires could actually charge people for the privilege of being bitten! Over the last few blog posts, I have considered a wide variety of objections to legal markets in blood: Vampires aren’t real. Too many people fear the undead. Vampires prefer raiding to trading. Vampirism is contagious and thus self-destructive. None of these arguments, however, hold water. First, even if vampires are not real (or are they? ), it is still useful to imagine a world in which actors with diametrically opposed interests — vampires and their victims — are still able to engage in mutual cooperation. Secondly, even if most people fear vampires, legal markets put a cost on our fears and thus help us to overcome our fears. In brief, the true or economic costs of not trading with vampires are the benefits foregone — not just revenues or profits, but also friendship and romance — from not interacting with vampires. Thirdly, even if vampires prefer raiding to trading, raiding exposes vampires to the risk of lethal retaliation. Legal markets, by contrast, provide a safe and positive sum outlet for expressing and satisfying our preferences and creative impulses. Lastly, even if vampirism is contagious and self-destructive — thus leading inevitably to a “tragedy of the blood commons” — legal markets offer the best solution to this potential problem. Legal markets require well-defined property rights along with the enforcement of contracts, and it is these conditions that reduce the risk of overuse or, in the case of vampires, oversucking. I thus conclude this post with three conjectures: (1) Legal markets in blood would benefit both humans and vampires. (2) With legal markets, the rate of vampire violence would decline dramatically. (3) Legal markets would break down social and cultural barriers between humans and vampires. This entry was posted on Tuesday, January 6th, 2015 at 3:09 pm	and posted in Uncategorized. You can follow any responses to this entry through the RSS 2.0 feed. I think that in a market where vampires need blood to survive it would not be in their best interests to turn every “blood seller” into a “blood buyer” because then they would run out of the necessary supplies in order to survive(blood). Although vampires might think it is cheaper to just ‘take’ the blood from humans, it might not be since they have to hunt and capture instead of just being civil and buying. I agree at the end with the summing up, legalized blood markets would definitely be beneficial. But to the argument about vampires turning all the blood producers to consumers, there is an easy counter. All humans have to do is withdraw their blood on their own and put it into pouches, not let vampires bite them each time they need to feed. It destroys the whole argument.